This recipe couldn't have come at a better time. A co-worker gave me several pears from their backyard tree. They remind me of our backyard apples, lots of spots but beautiful, juicy fruit on the inside. The Pear and Cranberry Muffins are the same base recipe as the Peach Muffins we made in August. This recipe makes a lovely, moist muffin. I decided to make 6 large muffins instead of the 12 small ones. They took about five minutes longer to bake. I used lemon zest instead of orange zest and rehydrated craisins for the cranberries. Not being a big gingersnap fan, I was a little concerned about the flavor of the topping. 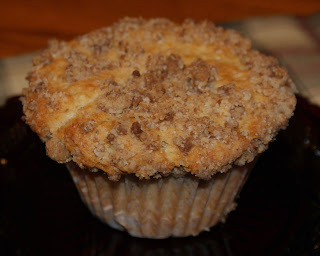 Boy was I wrong, the topping ended up being one of my favorite things about these muffins. I used store bought gingersnaps. Next time I make these, I will use more pears. Thanks to Jennifer of Maple N' Cornbread for choosing this week's recipe. The recipe can be found on her blog. You can find the links to all of the other Sweet Melissa Sunday's bakers he For links to all of the Sweet Melissa Sunday's bakers here. Next week's Sweet Melissa Sunday's is Butter Toffee Crunch, a perfect recipe for holiday giving. These look so good and Im glad you liked the Gingersnap crumble topping..I love it too. It was a nice surprise! The crumble was my favorite part too! MM! now that you say it, i think i might add more pear next time too. my fiance asked me, 'where are all the pears?' - maybe could have used a bit more. i didn't chop up the cookies ALLLL the way - i left some a little chunksky to have some extra crumbliness to it. :) maybe thats why? Your muffins look great. I used storebought gingersnaps too and thought the crumble was fantastic! I had baked some molasses spice cookies this weekend and used them for the crumble. Your muffins look great. Ooo, they look lovely! I agree - I think next time I'm going to up the pears. Great job on your muffins; they look great! The muffins look great! I'm glad you ended up liking the crumble. I remembered the peach muffins didn't have quite enough fruit, so I used a little extra in these. Glad you enjoyed these. I thought about adding some grated pear to the batter next time because I didn't think the pear flavor really came through. I still loved them!